Major weather events and climate changes are leading architects and developers to create interesting new responses to an evolving environment. Innovative ways of thinking about buildings and urban design will be necessary in some waterfront redevelopment projects -- especially those integrated within existing urban infrastructure -- contends Michael Liu, principal at Boston-based architecture and master planning firm, The Architectural Team (TAT). Driven by building codes hoping to address rising sea levels and the reality of increasingly flood-prone neighborhoods, architects working in coastal areas or flood plains are often required to raise habitable space above street level. 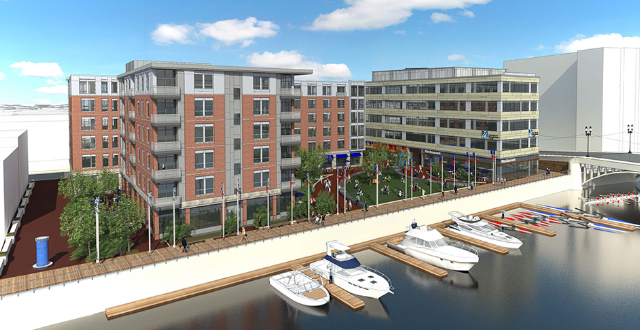 Recent TAT projects in Lynn, Salem, and East Boston, for example, were designed with their first floors seven to eight feet above the surrounding streets, even though many of the structures are several blocks from the water. As Liu points out, "Behind any new waterfront project must be the understanding that as sea levels rise, the conditions under which waterfronts and nearby areas presently exist will not be the same as the conditions we'll see long-term, and periodically in the near future." This strategy of elevating living space, he says "is a necessary response to the long-term challenges of sea level rise in order to safeguard projects in these areas." However, raising the first floor of a building so far brings new design challenges. Liu cautions that architects and developers will need to formulate strategies for connecting these new elevated buildings to existing street levels so that the façades maintain a relationship to existing context, with particular attention to the quality of the pedestrian experience. In addition to this near-term design concern, designers must consider how projects can remain viable when existing streets become permanently inundated. Michael Liu, as Vice President and Principal of The Architectural Team, is responsible for overseeing the firm’s design and recruitment efforts. With more than 30 years of professional design and masterplanning experience, he holds registrations in nine states and has been a registered architect in Massachusetts since 1984. Michael has directed the design of a wide range of developments across the hospitality, recreation, residential, mixed use and commercial sectors. His design work has been honored with awards from notable professional and trade associations, including the American Institute of Architects, the Boston Society of Architects, and the Massachusetts Historical Commission, among others. 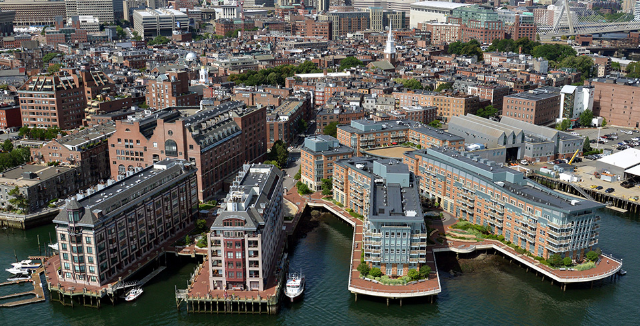 Michael’s recent work includes Battery Wharf, 375 Newbury Street, Lovejoy Wharf, The Kensington, the master plan for the Massachusetts Mental Health Center and the proposed designs of 40 Trinity Place, a five-star hotel and condominium tower in Copley Square, as well as Clippership Wharf, a 500-unit waterfront community in East Boston.